Senior Piping, Ceòl Mòr (B360): Pìobaireachd, competitor’s choice: 1 Gordon McCready, Rinn Friù, James R Johnston Memorial Trophy; 2 Archie Drennan, Druim na Drochaid; 3 Angus Finlay MacPhee, Inbhir Nis. Ceòl Beag (B361): Playing a four-part, 2/4 March, Strathspey and Reel: 1 Gordon McCready, Rinn Friù, John T. MacRae Cup, Sheelah J Nicol Memorial Trophy for the highest aggregate marks in B360 and B361; 2 Archie Drennan, Druim na Drochaid; 3 Dr Peter McCalister, Dùn Bhlàthain. Hornpipe & Jig (B362): Playing a hornpipe & jig, competitor’s choice: 1 Gordon McCready, Rinn Friù, Argyllshire Gathering Quaich; 2 Callum Wynd, Dùn Bhlàthain, The Argyllshire Gathering Prize; 3 Archie Drennan, Druim na Drochaid. Junior Piping, U19 Pìobaireachd (C132), open: 1 Gregor Macdonald, Àrd-sgoil an Òbain, W.G.G. Wilson Trophy; 2 Ross Conner, Sgoil Ghràmar Ceann Loch Chille Chiarain, 3 Brodie Watson-Massey, Sgoil George Heriot. Bagpipes Ages U15 (C108): Play a march, own choice. Minimum 4 four parts each: 1 Bobby Allen, Sgoil Chryston, Roderick Munro Quaich; 2 Catriona Norman, Àrd-sgoil MhicLabhrainn; 3 Eala Niamh McElhinney, Sgoil Ghàidhlig Ghlaschu. Bagpipes Ages U15 (C109): Play a Strathspey and Reel, own choice. 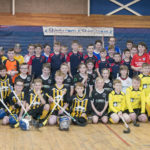 Four parts each: 1 Bobby Allen, Sgoil Chryston, Lighting Electrical Cup; 2 Dugald MacKechnie, Acadamaidh Dholar; 3 Calum E. MacMillan, Sgoil Lionacleit. Bagpipes U19 (C131): Play a Jig, own choice. Minimum four parts each: 1 Bobby Allen, Sgoil Chryston, Col Murdoch Mactaggart Bowmore Memorial Trophy; 2 Brodie Watson-Massey, Sgoil George Heriot; 3 Hamish Drennan, Acadamaidh Inbhir Pheofharain. Chanter U13 (C85): Play a March, own choice. Two parts only: 1 Màili MacLennan, Bun-sgoil Ghàidhlig Inbhir Nis; 2 Rory Turner, Bun-sgoil Ghàidhlig Phort Rìgh; 3 Caitaidh MacLean, Sgoil Uibhist a Tuath. Chanter U13 (C85A): Play a Gaelic Air, own choice. Two parts only: 1 Joe MacPherson, Àrd-sgoil Bearraig a Tuath; 2 Caitaidh MacLean, Sgoil Uibhist a Tuath; 3 Archie Johnston, Bun-sgoil Bhun Easain. Bagpipes U13 (C86): Play a March, own choice. Confined to players who have not won first prize in a Novice Competition prior to 14/10/2018: 1 Logie Johnston, Àrd-sgoil an Òbain, Roderick Ross, Ferintosh, Memorial Trophy; 2 Harrison Bishop, Àrd-sgoil Eastwood; 3 Hector Finlayson, Bun-sgoil Caol Loch Aillse. Bagpipes U19 (C130): Play a March, Strathspey and Reel own choice. Minimum four parts each: 1 Brodie Watson-Massey, Sgoil George Heriot, Royal Highland Fusiliers Cup; 2 Bobby Allen, Sgoil Chryston; 3 Hamish Drennan, Acadamaidh Inbhir Pheofharain. Junior Instrumental: Accordion (Piano or 3/4/5 row button instrument with Stradella bass Under 19 (C178): Play a March, Strathspey and Reel in the Highland/Gaelic/Piping idiom; own choice: 1 Ciorstaidh Chaimbeul, Caol Loch Aillse, Smith Mearns Trophy; 2 Archie MacKechnie, Acadamaidh Dholar; 3 Kieran MacCormick, Sgoil Lionacleit. Accordion (Piano or 3/4/5 row button instrument with Stradella bass) Under 13 (C84): Play a March, Strathspey and Reel in the Highland/Gaelic/Piping idiom. Own choice: 1 Anndra Uisdean Cuimeanach, Àrd-sgoil Gheàrrloch, Daniel G R Burt (Chapelhall) Airdie Memorial Trophy, The Smith Mearns Trophy; 2 Innes MacKinnon, Àrd-sgoil Thiriodh. 3 Eòin Coinneach Cuimeanach, Àrd-sgoil Gheàrrloch. Piano U13 (C81):Play a slow Gaelic Air and March, own choice: 1 Alice Maclennan, Sgoil George Heriot, Jenny M.B. Currie Kilt Pin; 2 Isla Thoms, Sgoil Ghàidhlig Ghlaschu; 3 Eilidh Thoms, Sgoil Ghàidhlig Ghlaschu. Piano Ages 13-18 (C116): Play a slow Gaelic Air and March, own choice: 1 Rae MacIver, Sgoil Ghàidhlig Ghlaschu, Margaret Hill-Boyle Memorial Trophy; 2 Evie Glen, Àrd-sgoil Biggar; 3 Emily Armstrong, Bun-sgoil Thiriodh. Fiddle U13 (C83): Play a slow Gaelic Air and March, followed by a Strathspey and Reel, own choice:1 Meredith Kennedy Kiemer, Sruìghlea; 2 Zoe Drysdale, Sgoil Ghàidhlig Ghlaschu; 3 Ruaraidh Drennan, Acadamaidh Inbhir Pheofharain. Fiddle Ages 13-18 (C118): Play a slow Gaelic Air and March and Strathspey and Reel, own choice:1 Abbie Morris, Àrd-sgoil Ìle, Robert MacCallum Memorial Trophy; 2 Alasdair Campbell, Sgoil Ghàidhlig Ghlaschu; 3 Skye Beautyman, Sgoil Ghràmar Dhùn Omhain. Fiddle Groups U19 (C176): Play a minimum of three tunes in different tempos in traditional Highland style: 1 Tarsainn na Drochaid; 2 Village School of Music Fiddle Club; 3 Na Daoine Beaga. Senior: Fiddle Groups (B342): Playing a Slow Air, March, Strathspey and Reel. Scottish traditional tunes, competitor’s own choice: 1 Bùth-obrach Fidheall Chean Loch Goibhle, Dr & Mrs Atholl Robertson (Oban) Trophy; 2 Na Seann Daoine; 3 Cowal Community Orchestra. Folk Groups: U19 (C172): Perform two contrasting songs of own choice with accompaniment of musical instruments: 1 Còmhlan Sgoil Chiùil Obar Dheathain, The Allan Thomas Mitchell Trophy; 2 Deàrrsadh; 3 Deugairean Thròndairnis. 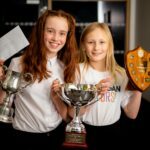 U13 (C172A): Perform two contrasting songs of own choice with accompaniment of musical instruments: 1 Clann Thròndairnis, The Murdo MacFarlane Trophy; 2 Na Smeòraich; 3 Ceòl Beag. Action Song: Under 13 (C87B): Song with actions illustrative of the theme or demonstration of labour action accompanied by song: 1 Clann Thròndairnis; 2 Còisir Òg Loch Àlainn. Drama: U13 (C87A): Original play devised and staged by school or group presenting the playlet. : 1 Sgoil Ghàidhlig Ghlaschu, Donald Macdonald Memorial Trophy. Waulking: U19 (C180): 1 Clann Thròndairnis, The Harris Tweed Authority Award. Junior choral: Unison U19 Open (C173): Sing two songs: 1 Rionnagan Rois, Queen Elizabeth Coronation (1937) Trophy; 2 Còisir Òg Ghàidhlig na h-Eaglaise Brice; 3 Còisir Òg Ghàidhlig Ìle Ghlaschu. Two-part Harmony U19 Open (C174): Sing two songs: 1 Còisir Òg Ghàidhlig Ìle, Tom Crawford Trophy; 2 Còisir Òg Ghàidhlig na h-Eaglaise Brice. Puirt-a-beul U19 Open (C175): Unison singing of prescribed puirt a beul: 1 Còisir Òg Ghàidhlig Ìle, Martin Wilson (North Berwick) Trophy, 2 Còisir Òg Ghàidhlig na h-Eaglaise Brice; 3 Rionnagan Rois. Còisir Òg Ghàidhlig na h-Eaglaise Brice, Iain Thomson Memorial Trophy for the highest marks in Gaelic in C173, C174 or C175, East Kilbride District Council Trophy for the highest aggregate marks in C173, C174 and C175, Jean Walker Memorial Trophy for the highest marks in Music in Competitions C173, C174 or C175. Donald and Mamie MacPhail Trophy; 2 Còisir Bun-sgoil Achadh na Creige. Puirt-a-beul, Under 13 Learners (C78): Prescribed puirt a beul: 1 Còisir Ghàidhlig Bun-sgoil Phort Ilein, Macintyre Cup, The Olive Campbell MBE Trophy; 2 Còisir Bun-sgoil Achadh na Creige; 3 Còisir Òg Loch Àlainn. Two-part Harmony U13 Learners (C77): Sing two songs: 1 Cairdean Ciùil Ìle, Susan Paterson Caledonian MacBrayne Trophy. Unison Rural Primary Schools Only (C03): Sing two songs: 1 Còisir Ghàidhlig Bun-sgoil Phort Ilein, Badenoch & Strathspey Area Committee Trophy. Solo Singing: Ages 5-6 Learners (C27): Singing of a prescribed song: 1 Bella Derevyankin, Acadamaidh an Tairbeart, Joan Campbell Memorial Trophy; 2 Calum Michael Morrison, Sgoil Ghàidhlig Ghlaschu; 3 Rhona Jane MacLeod, Sgoil Ghàidhlig Ghlaschu. Ages 7-8 Learners (C27A): Singing of a prescribed song: 1 Eva Bisp, Bun-sgoil Achadh na Creige, Hugh Macintyre Memorial Cup; 2 Millie Kathryn Bonniwell, Bun-sgoil Achadh na Creige; 3 Isla McKechnie, Còisir Òg Loch Àlainn. Girls Ages 9-10 Learners (C51): Singing of a prescribed song: 1 Aimee Macleod, Sgoil nan Loch, Mrs Roderick B Munro Trophy; 2 Mary Morrison, Sgoil an Rubha; 3 Rowan Willis, Còisir Òg Loch Àlainn. Girls Ages 11-12 Learners (C51A):Singing of a prescribed song: 1 Doireann Marks, Sgoil Lionacleit, Ronald MacEachen Memorial Cup; 2 Anna MacLeod, Sgoil Lionacleit; 3 Katie Mactaggart, Àrd-sgoil Ìle. 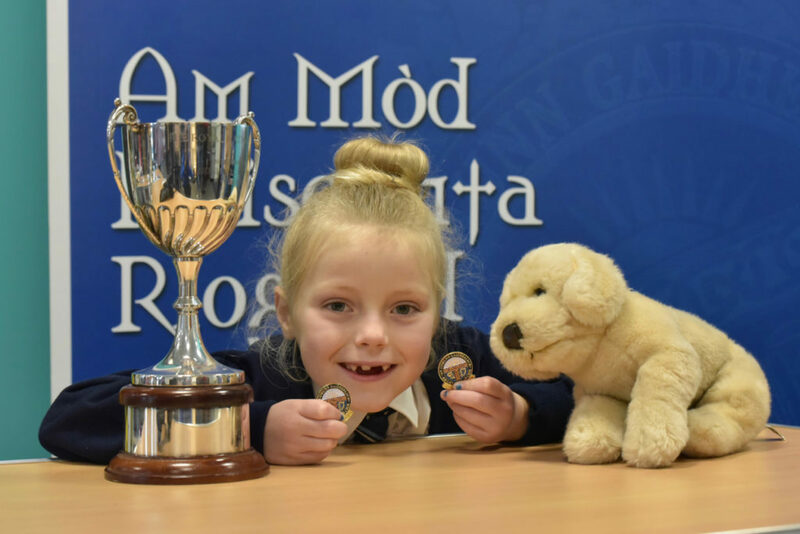 Aimee Macleod, Sgoil nan Loch won the Donald Macleod Trophy for the highest mark in Gaelic in C51 and C52. Boys Ages 9-10 Learners (C52): Singing of a prescribed song: 1 Liam Gray, Bun-sgoil Bhogha Mòr, Dr Archie MacKinnon (Islay) Memorial Trophy; 2 Innes MacKay, Bun-sgoil an Dùn Beag; 3 = Harvey Smith, Bun-sgoil Chondobhrait Aiden Munro, Bun-sgoil Port Ilein. Liam Gray, Bun-sgoil Bhogha Mòr and Innes MacKay, Bun-sgoil an Dùn Beag, Donald Macleod Trophy for the highest mark in Gaelic in C51 and C52. Boys Ages 11-12 Learners (C52A):Singing of a prescribed song: 1 Calum MacLeod, Sgoil Uibhist A Tuath; 2 Seumas MacRae, Sgoil MhicNeacail; 3 Oisin Liam Crawford, Rionnagan Rios. Boys Ages 13-15 Learners (C103): One prescribed song. James C McPhee Medal: 1 Oscar Tormod Fish, Sgoil MhicNeacail, James C. MacPhee Memorial Medal; 2 Archie Kennedy, Còisir Òg Loch Àlainn; Hamish Kennedy, Còisir Òg Loch Àlainn. Girls Ages 13-15 Learners (C102): One prescribed song. James C McPhee Medal: 1 Holly MacLean, Àrd-sgoil Thobar Mhoire, James C. MacPhee Memorial Medal; 2 Kirsty Nicolson, Sgoil MhicNeacail; 3 Abbie Morris, Àrd-sgoil Ìle. Holly MacLean, Àrd-sgoil Thobar Mhoire, won the Jean Graham Memorial Trophy for the highest marks in music in C102 and C103 and Alexander Hamilton Trophy for the highest mark in Gaelic in C102 and C103. U19 (C177): One song, own choice. Confined to first prizewinners of solo singing competitions at previous Royal National Mods: 1 Ruairidh Gray, Sgoil Lionacleit, Skelmorlie and District Highland Association Quaich; 2 Alice Nic a’ Mhaoilein, Sgoil MhicNeacail; 3 Samuel MacAoidh, Sgoil MhicNeacail. Traditional Singing Open Ages 16-18 Learners (C145A): One song sung in traditional style, own choice: 1 Rachel Bolton, Còisir Òg Loch Àlainn, Provost of Falkirk Medal. Junior Duet: U13 Learners (C79): 1 Rebecca Morris and Rowan Morris, Bun-sgoil Port Ilein, Angus MacTavish Memorial Trophy; 2 Rosie Blyth and Feorlin Renton, Bun-sgoil Inbhir Aora; 3 Dearbhla Newman and Charlet Munro, Bun-sgoil Port Ilein. Oral: Poetry Recitation Ages 5-6 Learners (C26): 1 Calum Michael Morrison, Sgoil Ghàidhlig Ghlaschu, Phemie Wilson Memorial Trophy; 2 Finlay Tarves, Bun-sgoil Lacasdail; 3 Bethan Newall, Bun-sgoil Chondobhrait. Poetry Recitation Ages 7-8 Learners (C26A): 1 Millie Kathryn Bonniwell, Bun-sgoil Achadh na Creige, Rotary Club of Falkirk Trophy; 2 Niamh McCrudden, Sgoil Ghàidhlig Ghlaschu; 3 Esme McLeod, Bun-sgoil Achadh na Creige. Poetry Recitation Ages 9-10 Learners (C49): 1 Lauren Morris, Bun-sgoil Bhogha Mòr, Cowal Trophy; 2 Charlet Munro, Bun-sgoil Port Ilein; 3 Rhuraidh Blair, Bun-sgoil Port Ilein. Poetry Recitation Ages 11-12 Learners (C49A): 1 Rowan Morris, Bun-sgoil Port Ilein; 2 = Rebecca Morris, Bun-sgoil Port Ilein and Iona Willis, Còisir Òg Loch Àlainn; 3 Rory Urquhart, Acadamaidh Rìoghail Inbhir Nis. Sabhal Mòr Ostaig Silver Medal: 2 Elizabeth MacMillan-Currie, Àrd-sgoil Ìle. Poetry Recitation Ages 16-18 Open (C150): 1 Ruairidh Gray, Sgoil Lionacleit; 2 Rachel Bolton, Còisir Òg Loch Àlainn; 3 Seumas Scullion, Àrd-sgoil Ghàidhlig Ghlaschu. Conversation Ages 5-8 Learners (C24): 1 Esme McLeod, Bun-sgoil Achadh na Creige, Sabhal Mòr Ostaig Silver Medal; 2 Niamh McCrudden, Sgoil Ghàidhlig Ghlaschu; 3 Calum Michael Morrison, Sgoil Ghàidhlig Ghlaschu.